Transylvania is a region in central Romania that is diverse not only in terms of the landscape with beautiful green hills, lakes, historical gems such as castles, fortresses and cathedrals but also an eclectic mix of cultures, ethnicity, linguistics and religions. Until the end of World War 1, the region was still a part of the Austrian - Hungarian empire before it ultimately became a part of Romania. You will see a mix of Romanian, Hungaria and ethnic German (Saxon) population here now, and this is reflected in the architecture as well as the urban landscape of the region. One of the top things to do in Transylvania is to explore the complicated history and visit the many historical landmarks and culturally significant sites the region has to offer. Transylvania has also, traditionally, been associated with mythical characters, stories and tales (I'm sure you've heard about Dracula's association with this region). It is rich in medieval fortresses, fortified churches, old towns, and quaint villages that till date, have maintained a sort of laidback, disconnected and rustic feel. The top things to do in Transylvania include a visit to some famous well-maintained icons, rich in history and folklore, as well as the rural countryside with its unique way of life, and of course, exploring the many small cities and towns. Replete with numerous castles and fortresses, some of which are even inaccessible today, Transylvania's royal historical architecture is reflective of the troubled era that they were built in. Many of them today exhibit the instruments of torture that were once used and the ghastly prisons that were used to capture criminals. Constant wars and the fight for power led to the need for creative and heavy defence infrastructure, which is visible on its raw form today. Although many of them were targetted at a later stage by the communists, who ripped them of the opulence they once flaunted, leaving them bare and unattractively basic from the inside, they're still a great insight into the way of life back in the 14th and 15th centuries, in this part of the world. With such diverse architecture that reflects the settlements over a large period of time, exploring the castles was one of my favourite things to do in Transylvania. Probably the most picturesque castle because of it's setting with the Bucegi Mountains in the backdrop and the German new-Renaissance architecture, Peles Castle is a popular castle located in the cute little town of Sinaia, only 1.5 hours away from Bucharest and 30 minutes away from Brasov. The castle is fairly new, built in the late 19th century by King Carol I and was used as the summer residence of the royal family up until mid 20th century. Very plush interiors, with Murano crystal chandeliers and mirrors, teak-wood furniture, beautiful ceiling and wall paintings, and stained-glass windows, Peles Castle is representative of immense luxury - and a pleasure to take a guided tour of. It is also the first European castle known to have electricity, an accomplishment not so common in the mid to late 19th century. You can enter Peles Castle only on a guided tour (also available in English) and although it is reasonably priced (Lei 30 per person), there was a photo tax which you needed to pay if you wanted to take any pictures inside the castle, even if it is just with a phone, and this was (ridiculously) another Lei 35, double of the entrance and guided tour price. Nevertheless, the interiors are beautifully done and I recommend that you pay this photo tax. More popularly known Dracula's Castle, Bran is one of the most visited castles in Transylvania but for all the wrong associations! This castle is linked with Dracula (the fictional character who is a Vampire) because it perfectly fits the description of the character's place of residence as per the novel by Bram Stoker, as being located high above a valley perched on a rock with a flowing river below, in Transylvania. Alternatively, a notoriously cruel ruler in Romania, Vlad the Impaler, or Vlad Dracul is also often confused with the mythical character of Dracula. His association with this castle was, however, minimal or non-existent. In reality, the castle is not in any way historically linked to any vampires or ghostly creatures. The only association between the two is that the cruelty of the ruler Vlad Dracul is what inspired the fictional character Count Dracula in Bram Stoker's novel. The most interesting part of the castle is the exhibition of the medieval instruments of torture - a chilling display of the methods used to torture the prisoners during those days. Unlike most other castles in Romania, you did not require a guided tour to enter this castle and you're to explore on your own, although I would recommend you get to it early as possible as there are massive queues on most days. Exploring Bran Castle has to make it to the top of the list of things to do in Transylvania! Several movies have been shot at this well-preserved Gothic masterpiece - Corvin Castle, the most recent one being The Nun. Apart from being one of the largest castles in Europe, Corvin is also notorious for being one where Vlad the Impaler (also known as Dracula, but not the same as the fictional character from Bram Stoker's book) was held for several years, although the validity of that story has not been established. The main purpose of the original castle that was built in the 15th century (and later restored in the 17th) was of defence and imprisonment, an example of which you can see inside the castle, where you can access the dungeon which was once used to imprison and eventually, murder the prisoners. You do not need a guided tour to enter this castle and there is a minimal (reasonable) photo tax to take pictures in this one. Personally, of all the castles I visited in Romania, this one was my favourite and thus, made it to my list of top things to do in Transylvania. A fortress perched on the hilltop, forming a typical European small-town backdrop, Rasnov is not too far from the city of Brasov. Unlike most other Saxon fortresses, this one was designed for the purpose of refuge over several centuries, which is why it houses a school, a chapel and houses, almost like a little village in itself. The stone fort with its orange-red rooftops rises dramatically above the town of Rasnov, in the Carpathian Mountains and can be reached by a cable car. Today, the fortress lies in ruins and is surrounded by several souvenir shops and local sellers. Nevertheless, a walk in the narrow alleyways inside the fortress, all the way to the top, makes for great views of the city below. The stone buildings inside the fortress are absolutely spectacular and transport you into the olden times. The castle itself was a little disappointing, considering that it was completely stripped of all it's interiors - including the furniture and artistically painted walls, during the communist era. The castle was built in the early 20th century in New-Romanian style, which did not impress me as much as the Gothic architecture does. Also, you could enter the castle only with a guided tour, which was in Romanian, not English! However, the setting of this castle is absolutely gorgeous, with a view of the mountains and the valley. If you're visiting Peles Castle, you can drop by to visit Cantacuzino Castle, even if you do not plan to explore inside the castle. Their terrace restaurant with lovely views of the Bucegi Mountains might be a good place to enjoy a drink! One of the top things to do in Transylvania is to spend some time in the rustic villages, which still seem to have preserved the simplicity, charm and conventional lifestyle of the olden days. Artisinal decorative objects, home-made bread and cheeses, locally-brewed drinks and freshly picked fruit and vegetables are the way of life here. You may have a little bit of language difficulty because a few people speak English comfortably here but the experience, nevertheless, is like walking into a time warp and being transported back into the middle ages. Don't be surprised to see shepherds tend to their cows, old men and ladies enjoy a gossip session in the evenings, hand-knitted woolens being displayed and sold at very reasonable prices, wood-carved cutlery being used to serve food, and people flocking to the village church for the Sunday mass. Life is blissfully simple! One of Romania's key UNESCO World Heritage Sites can be found in Prejmer. An intriguing fortified church which is an architectural and cultural beauty, in my opinion, Prejmer's fortified church is over 800 years old and extremely well-preserved! The church is surrounded by tall, think walls which were to defend the people of the city and provide a refuge to them when being attacked. Each resident of the village was granted a room in case of an emergency, and the church also houses a school which continued to educate the children even when the war was on. The entrance to the church has a small courtyard followed by a tunnel, which still has the iron gates that could be used to block the enemy out when under attack. It is said that Prejmer's fortified church was attacked on more than 50 occasions but was never conquered, which speaks volumes of how brilliantly the walls were constructed. The most interesting part of the site is the 'watch road', a tunnel inside the defence walls and next to the rooms allotted to the residents during attacks. You can walk the entire 360 degrees of this tunnel and get a good idea of the defence tactics used by the people in those days. Prejmer is about 30 min away from Brasov, making it a good stop on the way to visiting Sighisoara. This village, although one of many in Romania, became popular about a decade ago when Prince Charles visited it and fell in love, so much so that he even bought a traditional house here. Viscri Village also has been designated as a UNESCO World Heritage Site and is undoubtedly a great Saxon village to explore. Despite being sensationalized in the recent past, the village has still managed to retain it's untouched, authentic beauty. If you do plan to drive here, beware of the unpaved roads and numerous potholes on the way. Like most other villages and small towns in Romania, the central and key attraction of Viscri is also its fortified church. I was lucky to arrive on a day when a local band was playing some traditional Romanian music in the church courtyard. Climb to the church's towers to enjoy a fantastic view of the surrounding green countryside, the hand-tiled red-roofed houses, the hills and the meadows. Do not forget to visit Cafe Artizanat, a courtyard cafe not too far from the church, for some freshly made bread, homemade cheese and elderflower cordial and freshly baked cakes. Visiting a rural locale is definitely one of the top things to do in Transylvania in my opinion. Three towns stand out as being known as some of Europe's best preserved medieval fortified towns - Brasov, Sibiu and Sighisoara. These three walled locales once formed a part of 'Siebenburgen' (Seven Fortresses) which were adopted as the home of the Saxons that came to Transylvania in the 12th century. The craftsmen and merchants established powerful and rich citadels, the ruins of which can still be visited in most of these towns. Nine centuries of their residence in this area of Transylvania has left the towns with a unique cultural heritage - something you'll be made aware of when exploring these towns extensively. I was lucky to have a friend who is a local from Brasov, it gave me a deep insight into the history and heritage of South Transylvania. Visiting these three dreamy towns is highly recommended and one of the top things to do in Transylvania. A Hollywood-like sign with the name of the town atop the hill will catch your eye as you enter this charming fortified town with cobbled stone streets, Gothic and Baroque buildings and churches, ruins of the walls surrounding the town and the lush green Tampa Mountain in the backdrop. Brasov is one of the largest cities to have a fortified well-preserved old town in its centre and makes for a great base to explore the rest of Transylvania. I suggest to spend a few nights here and take day-trips to the other places from here. The city does not have nightlife like Bucharest but is charming, traditional, rich with history and culture, and surrounded by the Carpathian Mountains, making for a marvellous landscape. The monumental Black Church stands dramatically in the middle of the fortified town, colourful houses line the alleyways, red rooftops in the middle of green forests and mountains make for the perfect picture, especially when taken from a vantage point. Outdoor cafes and bars serving traditional Romanian foods and drinks make for a great vibe, that promises not to disappoint. Visit Brasov for its rich history, iconic architecture, warm people, great food and fairytale landscapes. This idyllic town was my favourite place in all of Romania that I was able to see. A culture that is so diverse and accommodating of Germans, Hungarians and Romanians, here you'll find some of the best local dishes, creative drinks and gelato. A distinct element you'll notice in the homes here are their eyelid shaped windows. Two pedestrian areas - The Upper Town and The Lower Town, accessible through a flight of stairs, with cobbled stone streets, numerous cafes, boutique shops and baroque architecture are the highlight of Sibiu. Piata Mare, or the Big Square, is where you can begin your exploration and visit the religious and architectural masterpieces such as The Catholic Basilica, The Orthodox Cathedral and the Lutheran Cathedral. Climb to the top of Lutheran Cathedral's steeple or The Council Tower for beautiful views of the town or cross the Bridge of Lies that, according to the legend, can tell when someone is a liar! 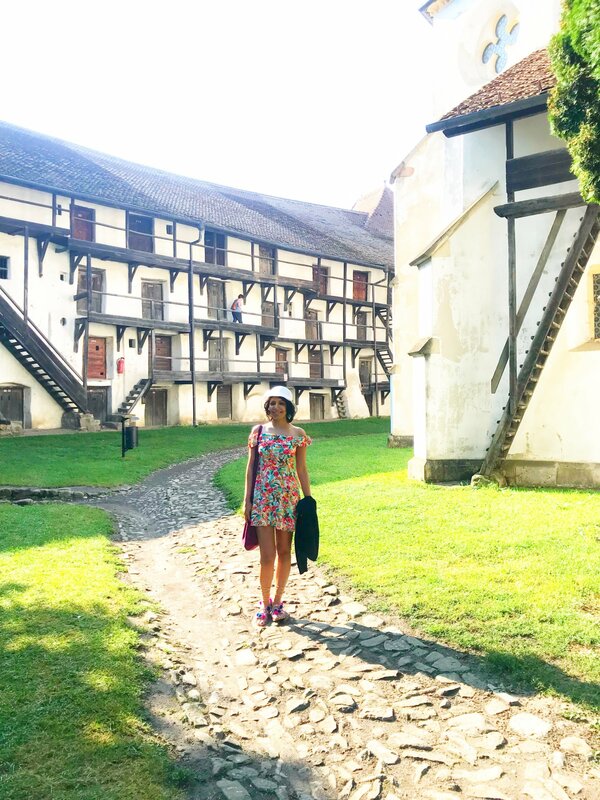 All in all, I'd recommend you to spend at least a day in Sibiu to be able to enjoy a leisurely stroll around one of the most magical and charming old towns in the region. Visiting Sibiu had to make it to my list of best things to do in Transylvania. A very cute old town, Sighisoara is the place to buy souvenirs to take back with you from Romania. Pastel coloured houses, quiet and empty streets, cosy cafes, and craft shops make for the perfect day at this dazzling UNESCO World Heritage Site, which once held great importance as a trading settlement. The town also has the house of Vlad Dracul, where he was born (the leader who inspired the character of Count Dracula in Bram Stoker's book), a popular place for tourists to visit. Due to its well-preserved fortified ruins (9 of the 14 strategic towers can still be seen), Sighisoara makes for one of the most beautiful and authentic towns in Transylvania. To enter the Sighisoara Citadel, you'd have to cross one of these towers, each of which is named after the original craft that was carried out in that tower (Blacksmith, Ropemaker, Shoemaker, etc). To get a fantastic view of the city from a vantage point, climb to the top of The Clock Tower, or go up the hill to visit Sighisoara's fortified church. There are several hiking trails in the Carpathian Mountains, and many of these start from Brasov. The mountains offer you a diverse variety of landscapes which include peaks, rocks, waterfalls, forests, plants and animals. Several people who have climbed the Tampa Mountain which lies in the backdrop have claimed to have seen wild bears too! If you're not looking particularly for tough hikes, but still love the nature, a visit to this gorgeous green lake (Bâlea) either by car, cable car or on foot is something I highly recommend. The glacial lake located high in the Făgăraș Mountains also knows as the Transylvanian Alps, is a treat for the eyes! Not only is the lake one of the most stunning ones you'll find in the region, the road to it is quite spectacular too. Transfăgărășan Road is one of the most scenic highways in Europe because of the hairpin bends and the winding paths. Even if you choose not to drive on this twisting road, you can take the cable car up from the Balea Waterfall station and you will be transported above this lovely road, with unparalleled views from a vantage point. Once you're at the lake, be prepared to be greeted with colder weather. A jacket during the summer would help as it can be breezy and may even rain unexpectedly. Walk around the lake, have a coffee or a meal (or even stay for the night if you like, in the lake chalet) on a wooden terrace above the green waters of the clear lake or go for a hike further up the mountains. However, do not expect to swim in it because the waters are really cold, even during the summer! During the winter, they build an Ice Hotel in the area which probably would be a fantastic experience, and the lake transforms into a ski resort! I would recommend you to visit this place on your way to Sibiu from Brasov (or vice versa). I was lucky to have a friend who is Romanian who gave me the best recommendations on the food to try. Transylvania, given the mix of cultures here in the past, has a fusion of dishes with German, Hungarian and Romanian origins, making it an interesting mix for those who love to try local cuisines when they travel. I'm a foodie and since food is one of the key attractions for me to explore the world, I was happy to try some popular Transylvanian dishes while in the region. Romanians eat a lot of pork and beef so if you're vegetarian or vegan, you might have a slightly hard time finding dishes to your taste. However, these Traditional Romanian Cabbage Rolls are absolutely delicious! I was lucky to be able to try them homemade, by my friend's mother, and they were absolutely yummy! This Bean Soup with bacon and chard is usually served in a bread bowl and is one of the most popular local dishes in Transylvania. That's another one for the veggies - roasted eggplant salad, usually served with bread. It's very simply made - with fresh ingredients such as onions, lemon juice, salt, pepper and parsley. If you like eggplant, you'll love it! These traditional Fried Cheese Donuts with sour cream and jam are sinfully delicious and a must try for those with a sweet tooth. They can be really heavy though, so keep enough space after your meal or share one between two people. If made at home, they can also be baked, however, if you're eating them at a restaurant, they're more likely to be fried. A traditional Hungarian pastry, like a sweet roll dough, is wrapped onto cylindrical moulds, rolled into sugar and oil and then roasted over open coal. It's quite easy and common to find this street food/ sweet in Transylvania. Yet another traditional Hungarian sweet, these Plum-filled Dough Balls are usually made using potato and dough stuffed with plum, cinnamon and sugar, and then boiled, like dumplings and covered in breadcrumbs. An interesting alternative to the Papanasi, though I'd recommend you try both! An alcoholic beverage made of plums, Tuica can be easily bought as souvenir shops across Transylvania and is usually served as an aperitif. It is known to be quite potent, so I decided to give it a skip but if you're into potent, alcoholic drinks, do give it a shot (no pun intended)! I personally fell in love with this drink on my trip (the alcoholic version of it anyway!). Made from Elderberry flowers, this drink is extremely refreshing on a hot day, after a long walk. The cocktail made from it, called Hugo, has lime, mint and prosecco, absolutely amazing! I couldn't get enough of it. If you have additional time to explore Transylvania, I would highly recommend to include the city - Cluj Napoca in your itinerary. I was unable to make it due to time constraint but it seemed like I missed out on a really vibrant city! Transylvania has been on my bucket list for the longest time. I adore the gothic architecture and am a massive Dracula nerd so definitely have to expedite this trip! Thanks so much for sharing, love your photos! My palate favours Asian flavours over European. I like food rich in spices! Transylvania looks as if one has opened the pages of a fairytale book. The place seems all the more charming because it seems to retain its pristine and vintage charm. The castles and fortresses seem to be enveloped in an aura of romance. The Lake Balea looks so ethereal. The only thing that probably would bring one down to reality from the realms of dreams seems to be the fried doughnuts. I passed through this region with a single overnight at a campsite, back in in the 1980s. I wish we’d taken the time to visit many of these wonderful castles, not least “Dracula’s castle”. A good reason to return, and see the famous region properly! Lake Balea looks beautiful with that green water! I’d love to take a stroll along there. Thanks for the tip about taking a jacket. I’m not a fan of being cold, but I think I’d like to go during the winter to see the Ice Hotel! Yea I have never seen an Ice Hotel. I’d love to see one myself. Yeah Bran Castle is the most popular and tourists usually land up there without realising there’s a lot of nature and beauty to explore as well. Never mind, there’s always a next time! You mentioned two fortified churches: Prejmer and Viscri. Those are the most popular but the UNESCO site actually includes 5 others as well. We liked the first two so much that we ended up going and visiting all the others too! Each one is different and charming! I wished I’d known about some of these castles, though, when we were there. We only saw Bran, and it was ridiculously crowded. Yeah, you’re right, there are 5 more but I didn’t visit all. I wanted to make it to Corvin Castle and Sibiu and was short on time! Growing up hearing about Dracula, I’d absolutely love to visit Transylvania and explore its castles someday. The medieval walled towns look like they are straight out of a fairy tale. And fried cheese donuts!? Yes, please. These look and sound so incredible! I’m drooling! That is a great deatiled informative post Medha. Honestly, I am taken over by Transylvania and I wish to visit it in the coming years. It has everything we would love enjoying in our trip from castles to beautiful landscapes, lakes and greens. Walking on the cobbled stone narrow lanes and getting clicked in between the colorful buildings will be my favourite thing. Food too looks awesome there. Great pictures gal. What a great post, interesting and informative detail and your photographs are great – the castle looks amazing and imagining how the ancient people live there. I enjoyed reading this! I have been to the nearby Romanian border during my Ukraine visit and I can understand how beautiful Romania is. Transylvania is beautiful with those cobbled stoned quaint towns, castles and fortresses. Rasnov fortress with the backdrop of Carpathian mountains is splendid. I too loved the Carpathian mountain regions in Ukraine. Also, the food from Romania is interesting like roasted eggplant salad and Fried Cheese Donuts. When I went to Romania, only a day was spent in Translyvania. I found Bran Castle to be pretty disappointing. I think a drive by to snap a photo of it is plenty and touring the inside unnecessary. But Peles Palace was impressive. I wish I’d spent all of my time in these more charming towns than in Bucharest, which I really didn’t like at all. I didn’t like Bucharest much either. But then I am not really a big city person, I prefer exploring smaller, charming towns and countryside any day! Thanks for sharing this engaging post on Transylvania. To be honest, I’ve never actually seen so many castles in one place. As odd as it sounds, I find the places with the most complicated history; to be the most interesting. Hopefully one day, when I finish in Latin America, I’ll get the chance to visit. I would not have considered going there if it wasn’t for my friend who lives there (and a cheap, direct flight from where I live). But what a wonderful experience! I am one of those whose only knowledge of Transylvania is its association with Dracula. I did not know either that Dracula was in fact inspired by a real person , Vlad Dracul. After seeing this list, I am convinced that Transylvania is the kind of place I will surely love. I love exploring old towns and villages and Sibiu just might also be my favorite pick just basing on your decription. What a fantastic guide for what to do in Transylvania. The main thing I associated with the city was Count Dracula. Interesting to know there was actually no real association with Vlad Dracul. The food looks amazing, especially the cabbage rolls and the plum filled dough balls. All so yummy. Thanks for showcasing how much there really is to see and do in Transylvania. Not being a horror film fan, I would not have thought of visiting Transylvania. But I think the castles and fortresses are stunning to look at. Even if they have more dark pasts. I am sure the instruments of torture were quite fascinating. We love to wander in smaller villages to see a different aspect of life. Walled cities are always an interesting choice! The mountain roads look like a great escape. But I will make sure to be prepared for colder weather. The papansi look like a sweet treat for me. Thanks for this view of so much more to do in Transylvania! I loved Transylvania more than the capital of Romania, Bucharest. It has so much history, quaint villages and towns, and so much character and beauty. I encourage you to visit, it’s also very cheap! Your photos and description coincide with how I hoped Transylvania would look. It seems to have the perfect balance of really interesting history, beautiful architecture and lovely natural surroundings. These are exactly the kind of things that I look for in my European travels. What a great guide?! Thanks for this. All I know about Transylvania is their beautiful castles. But I’ve never expected that they’re more than beautiful through your photos, they make me more excited to visit the place. I am always fascinated by old castles, rustic villages and old medieval towns because of their magnificent architecture and their own unique histories. I can totally imagine myself living here. It would be a dream come true for me! I would definitely add Transylvania on my must visit places now! We‘ve never thought about visiting Transylvania, but now that we know that there are so many magnificent castles, we can’t wait to explore this part of Romania! And thanks for the list of awesome things to eat there! Carvin Castle is gorgeous and tops the list of my to visit places. When there, I would certainly check out some Kurtoskalacs. They look delicious. Corvin was my fav castle too! I’ve always been intrigued by Transylvania but never quite made it there yet. Your photos look idyllic, those charming little villages set in the green rolling hills. It’s definitely somewhere I’ll have to check out soon. How long do you think you need to do the area properly? I spent about 4 days in Transylvania. It was ideal but if I could have spent another couple of days, I would’ve loved to make it to Cluj Napoca, I’ve heard a lot of good things about that city. Exploring Transylvania’s castles would be fun! I’ve visited Bucharest but didn’t have time to visit those amazing Transylvania castles on my last visit. How long did it take you to get around all the castles? Bran Castle doesn’t even begin to scratch the surface 🙂 In fact, I liked Corvin Castle a lot more! Of course, the lake and Transfagarasan Road were the highlights for me. Balea Lake was my favourite place too! Wow! All the castles are so beautiful and it makes Romania look like a fairytale land. Lake Balea is just stunning too and looks like my kinda road trip destination. Also, those those cabbage roles and panasi? Yum! Looks like I need to plan a trip here ASAP! This is such a beautiful area with an amazing history to learn about. The amount of castles here is very surprising. I had no idea. That lake looks gorgeous. I could lose myself there for hours. There are so many castles in Romania! Some of them are hidden away in the hills, not even accessible. Oh, looks like a medieval paradise. There are so many castles and old houses. It seems to have an atmosphere. I have to admit that, other than the vampire lore, I didn’t know much about Transylvania. The castles, fortified villages, and beautiful scenery are definitely spectacular! And sign me up for the fried cheese donut! The architecture of these castles is truly whimsical. I hope to bring there the girls when they will be a little bit older and they will be familiar with Dracula’s story. I love castles and history and Romania looks really beautiful, especially the little villages. The food looks smashing, too. Great post! I love the idea of all the mythical characters, stories and tales that you mention. Living in Europe half the year I have no excuse not to go now. Thanks for the travel inspiration, I’ve now added Transylvannia to my list. That’s great. And yeah, since you live in Europe, I’m pretty sure you’ll get cheap flight tickets too! Transylvania comes across a perfect destination that we would love to slow travel considering there are so many things to explore. Saving these top things to do in Transylvania as whether its the fortresses or castles or villages to trying all the local food, these are just the things we love about our travel here. Any place that has mythical references has an additional charm of its own! Love it. The best part is – it’s not too crowded and touristy, yet. I’m sure you’ll love it. Romania has been truly a surprise for me and I wish I had more time to explore it. I must admit that the Bran castle didn’t really impress me, while I totally fell in loca with Brasov, so pretty! And I’ve already took note of Lake Balea for my next trip, it looks so beautiful! I agree with you. Bran didn’t impress me as much as I’d expected it to, either. Wow, what a great guide and fab photos. I’ve never really thought of visiting Transylvania before but I love exploring castles and the pastries look amazing. I’m going to start looking for flights today. Thanks for the inspiration. Wow, such beautiful impressions! Compliment, some really great photos I see here. You somehow managed to capture this beautiful ancient medieval spirit of that place. These castles look so impressive, I wonder how life must have been there back in time. The Corvin Castle looks somehow most interesting for me, would love to see how it looks inside. And yes, the dungeons… spooky but also very curious about how they look like. The Lake Balea looks also absolutely beautiful! Transylvania really made it quite high up on my list, thanks to your article. It really is an underrated country! Holy moly those fried cheese donuts, I have no idea what to expect! It’s always been a dream of mine to go to Bran Castle because I was always the Wednesday Addams of my neighborhood! But I like the way you integrated fact and history into your tourism post as well so it feels like we can go equipped with a little bit of knowledge. Wow, what a wonderful place. You truly inspired me to go and visit Transylvania at least once! Romania was not on my list at all but now it is! I have to see the fortified church and eat all of the food you pictured! To see all of the castles you would need some time. I had no idea there were so many beautiful ones in Romania. They have so many more forts and castles which are not even accessible, you can only see them perched on hilltops from a distance and can hike to them if you aren’t scared of wild bears lol. We could spend a year exploring all of these beautiful cities and there incredible architecture and castles. To sit by those lakes and observe the beauty around us would be magical. This area is incredible for sure. I hope we can make it there soon. It’s quite an underrated country! This is an excellent guide Medha, and so informative too. I’ve not visited Transylvannia but it’s so beautiful! I never knew they had so many castles there, only the Bran Castle. And the little villages and fortified towns are like something out of a fairytale. I never knew Prince Charles bought a house there too! Wonderful photos Medha of a stunning region of Romania! I always love trying local dishes when I travel! Those two were my fav castles too! Wow Medha, I really love your blogs. How nicely you detailed everything about Transylvania. You have mentioned about all the beautiful places to visit there. The castles are mind-blowing. Corvin Castle looks similar to Carcassonne, France. Great list of things to do as well, and finally the food options you have listed. I would love that plum filled dough balls. I just googled Carcassonne castle and you’re right, I see the similarity! Beautiful pics. I love small villages, towns, and castles. I may visit just for the bean soup! So there is no doubt that Transylvania is on my bucket list for the Bran’s Castle and all of the Vampire lore but I love all of the other stuff there is to see and do there. I had no idea that there were so many magnificent castles. I love the old villages and I actually audibly said, “whoa!’ when I saw your picture of Lake Banea. How beautiful. As for all of the food, I would gain 100 lbs eating all of the cabbage rolls and those sweet sugar rolls. Darcee would love that fried cheese donut too. I am not the biggest Plum fan but I would definitely eat that plum stuffed dough ball!